In her 72 years in Religious Life, Sister Hermogene Ruesken has been a shoulder of support. Spanning from the young Sisters in the Novitiate and people who visited the Franciscan Apostolic Center, to the employees she supervised, she has been a person from whom people learned the skills of hospitality, sought advice and support, or were the recipients of her Franciscan hospitality. From 1935-1969, Sister Hermogene worked in the Novitiate where the women who were entering Religious Life lived, worked, and received their religious instruction. “I just loved those years because I was the housekeeper and taught the Sisters our housekeeping skills, supervised their recreation…I guess I was like their Mother Hen,” she admitted with a chuckle. “We had a good time…even got in trouble a couple times….God used me to help these young Sisters and listen to those who were homesick,” she explained. In May 1969, she was considered as the Superior of 45 Sisters in Green Bay, WI. “I couldn’t imagine that God wanted me to leave the work in the Novitiate. I prayed that ‘His will be done’ and reminded myself to have faith,” she said. When she was selected, she knew that this was what God wanted. “I served in Green Bay for five years and loved it…I had a great time,” she explained. “Oh, my heavenly day! FAC was a beautiful place! 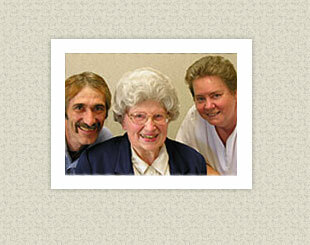 I met such wonderful people who came to us for some sort of healing,” she explained. “For more than 20 years I could help people – maybe just through a smile or a listening ear….everyone came through our doors because of a need and left with a sense of peace and happiness,” she said. “Throughout my life, I found that day by day I grew spiritually through the people I came in contact with. God used me as an instrument to bring His presence to people I met. I’ve been so blessed and have no regrets,” she said. As I grow older, I think back to my youth of being with friends and enjoying life. I also fondly recall my early years in the Convent when I played tennis, baseball, and volleyball,” she added.